Thus chanted a group of pro-immigration activists at the headquarters of the New York Immigration Coalition on a recent Thursday. “Administrative relief” is political jargon for unilateral action by the Obama administration to shield millions of immigrants in the country illegally from deportation. Immigration activists have been asking president Barack Obama to take executive action to stop deportations for years, and for years they’ve been—if not without great sympathy—gently rebuffed. When pressed about administrative relief during a 2011 White House roundtable, Obama reiterated again, “This notion that somehow I can just change the laws unilaterally is just not true.” As late as November 2013, when a heckler shouted to Obama that he could “stop deportations for all,” the president was firm in stating that he couldn’t. In 2014, Obama’s rhetoric evolved. At the first press conference after the recent midterm election, Obama reiterated the need for immigration reform, but said that if Congress doesn’t act, he’ll take action himself. “That’s a commitment that I also made … that I would act in the absence of action by Congress,” he said. No specific details have been released, but most observers see the administration’s next course of action as the expansion of the Deferred Action for Childhood Arrivals program (DACA) to cover the millions of immigrants, who entered the country illegally, who have children born in the United States or would have qualified for the immigration reform bill currently in limbo. DACA was created by the Obama administration in 2012 to protect young, educated immigrants with temporary residents status, without a criminal record from deportation. Now, the administration is expected to grant deferred action to millions of adults to ameliorate the separation of families. 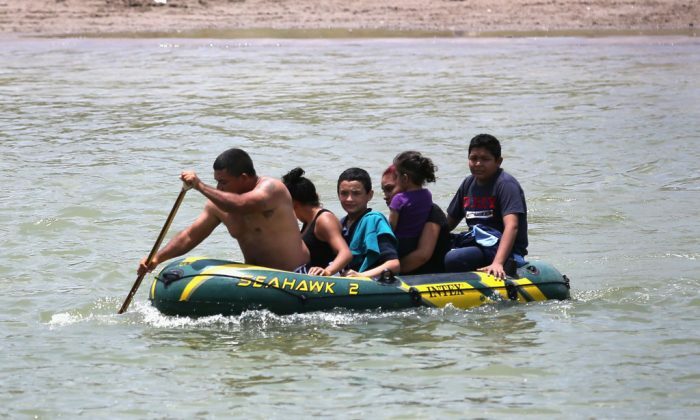 A 2009 Pew Research Center study estimated that in 2008, 4 million children who were born in the United States have at least one parent who came to the country illegally. Curbing deportation to stop the separation of families has been a top priority on the agenda of immigration activists. Administrative relief could shield 5 million to 8 million immigrants from the risk of deportation for as long as a pro-relief president is in power. “The president has the power to prevent family separation and the waiting must end now,” Jung Rae Jang, an activist with the MinKwon Center, said at Thursday’s rally. Conservatives have cried foul at the administration’s proposal. Sen. Ted Cruz (R-Texas) said in a letter to Senate Majority Leader Harry Reid (D-Nev.) that unilateral action on immigration amounts to “lawless amnesty” that would upset the “separation of powers” and provoke a “constitutional crisis.” Cruz and five other Republican senators promised to use “all procedural means necessary” to draw attention to execution action if Reid doesn’t help block it. These charges stem from a reading of Article II, Section 3 of the Constitution, which requires the president to “take Care that the Laws be faithfully executed,” and from Article I of the Constitution, which states, “All legislative Powers herein granted shall be vested in a Congress of the United States, which shall consist of a Senate and House of Representatives.” The administration’s critics argue that administrative relief would require the president to violate existing laws and to in effect write new law. Immigration scholars have lined up to defend the president, arguing that administrative relief for millions of immigrants living in the country illegally would fall in line with the long-standing practice of “prosecutorial discretion” and doesn’t transgress into de facto lawmaking. The country’s verdict on administrative relief would not only be a policy choice on the status of millions of illegal immigrants in the country, but could also redraw the boundaries of legislative and executive power. Prosecutorial discretion is the name for the freedom that law-enforcement officials have for prioritizing the individual cases they can prosecute with their finite resources. For example, the IRS devotes more resources investigating tax evasion by multimillionaires than of the very poor. Proponents of executive action on immigration said that because immigration officials don’t have the capacity to apprehend and deport all of the estimated 11 million immigrants who entered the country illegally, shielding select groups from deportation complements law-enforcement by directing them to those—such as violent criminals—better suited for deportation. In the field of immigration law enforcement, systemic prosecutorial discretion is already in place by way of the DACA program the Obama administration instituted in 2012 that gave immigrants with temporary residents status, who met certain requirements—having graduated high school, no felony record, and under 31 year of age—a two year immunity from deportation and a work permit. The program had approved over half a million applicants by March of this year, and the earliest applicants are now applying for a renewal of the program benefits. DACA was challenged in court by Chris Crane, president of the Immigration and Customs Enforcement (ICE) Council, in August 2012, on the grounds that the program required ICE agents to break federal law, but the case was dismissed because the judge didn’t have the proper jurisdiction, as the case had to go through a collective bargaining channel. The judge wrote that although he sided with the plaintiff, “The Department of Homeland Security has implemented a program [DACA] contrary to congressional mandate,” he had to dismiss the case because the Civil Service Reform Act of 1978 precluded him from adjudicating on such matters between federal employees. Is this evidence that DACA, and by extension administrative relief, could be illegal? “It was an odd advisory statement that had no real effect in that the case was dismissed,” Hiroshi Motomura, of the UCLA School of Law, wrote in an email interview. Motomura is an immigration scholar who drafted a letter signed by 100 law professors in 2012 urging Obama to adopt DACA. He said that the judge’s comments on DACA were “completely wrong,” and that even if the judge was right and the ICE agents won their claims through the proper channels, it would not dismantle DACA itself. Here, Motomura and opponents of DACA and administrative relief can agree; there’s little chance that the judicial system could strike DACA down. Josh Blackman, a professor at the Southern Texas College of Law, has argued that DACA is unconstitutional, but thinks that it could only be dissolved through the political, and not the judicial, process. For Motomura, the threshold for executive overreach would be if Obama failed to spend the funds Congress sets aside for enforcement, which would allow “400,000 or so deportations per year,” thus giving the president leeway for “a very large program” of administrative relief, because millions could be enrolled into DACA-like program and hundreds of thousands could still be deported each year. “Of course, he will reach political limits before he reaches legal limits,” Motomura said. Public opinion has been turning against a laxer immigration policy in the past two years. A poll from CNN shows the number of Americans who think that the government should prioritize deportation over developing a plan to grant legal status to immigrants who entered the country illegally, rose from 39 percent to 51 percent between September 2012 and June 2014. U.S. voters opposed to the president taking executive action to “grant amnesty to several million illegal immigrants” as described in “recent news reports”, and that 55 percent thinks that Congress should challenge the president in court if such action occurs. Still, the Rasmussen poll is the only known reputable survey on the public’s view of unilateral executive action on immigration, and not of immigration reform more broadly. To the extent that DACA remains in effect, it’s unlikely that expanding the number of recipients would change its legality, immigration scholars say. “I see no real legal distinction between having a program designed similar to DACA but applied to a different population,” said Shoba Wadhia, a professor at the Penn State School of Law. Wadhia has written extensively on the subject of executive action on immigration reform, and co-authored the letter signed by 136 legal scholars urging the president to go forward with relief for immigrants in the country illegally. The letter, sent in early September, plays the same role for large-scale administrative relief as the 2012 letter co-written by Motomura did for DACA. It provided a litany of legal justifications for relief, including an extensive enumeration of actions by prior administrations that also fell into the category of prosecutorial discretion: George W. Bush’s relief for foreign students affected by Hurricane Katrina in 2005, Liberians fleeing civil war in 2007, and Polish refugees from the Soviet crackdown on the Solidarity movement in 1981. Although there is vocal support for the administration among certain legal scholars, a consensus on the matter remains elusive, and some say that the legality of relief remains speculative, as the courts have yet to rule on the matter. Blackman said that the lack of action on the part of the judiciary to restrain the administration on DACA is no proof of its legality, offering as example the hostage exchange that resulted in the release of Bowe Bergdahl, a U.S. soldier captured by the Taliban in Afghanistan earlier this year. The Defense Appropriations Act requires that the Department of Defense give Congress a 30-day notice before using certain funds to transfer prisoners from Guantanamo Bay, which it did not do in the Bergdahl case and thus broke the law, according to the Government Accountability Office, which provides the official auditing of government activity. Blackman also said that the equivalent of administrative relief in other areas of governance would strike the public as a gross abuse of executive power. “Imagine if President Rand Paul said that the corporate income tax is way too high, I won’t enforce it, is anyone injured there? No one’s injured, you can’t stop that in court,” he said. Others are more confident in condemning systemic deferred action—and presumably any expansion thereof—as flat-out unconstitutional. “When the Archbishop of Canterbury and other high church officials were prosecuted for seditious libel for denying the validity of the King’s suspending power, the jury acquitted them in the celebrated Case of the Seven Bishops in 1688. Finally, in the Glorious Revolution of 1689, William III and Mary II replaced King James on the throne. As part of the new constitutional settlement, the monarch was henceforth denied suspending and dispensing powers,” Price writes. DACA is also different from the usual forms of prosecutorial discretion, Price argues, because its categorical nature “removes the risk of enforcement altogether” for a whole class of people. Price’s reference to the deterrent effects of the law echoes Obama’s own rhetoric from 2010, when he was still trying to pass the DREAM Act—the legislative form of DACA—and had to answer to activists why he couldn’t act alone. “It would suggest to those thinking about coming here illegally that there will be no repercussions for such a decision. And this could lead to a surge in more illegal immigration,” he said. But the DREAM Act stalled in Congress, and Obama announced the creation of DACA as a substitute, just as administrative relief now is to substitute for the comprehensive immigration reform bill, which, blocked by a Republican House, now has an even slimmer chance of passing with the addition of a Republican Senate after the election. Unlike DACA however, administrative relief promises to be far wider in scope, and is to be executed when the political capital of the Obama administration is at its ebb. A group of Senate Republicans announced its opposition to administrative relief the day after the election, and Republican members of the House have followed in kind. On Wednesday, Rep. Matt Salmon (R-Ariz.) said he had more than 50 GOP lawmakers’ signatures on a letter to Appropriations Committee Chairman Harold Rogers (R-Ky.), The Associated Press reported, urging that any spending bill include language saying nothing in it could be used to implement an executive immigration policy. 10 Things Your Feet Reveal About Your Health–Are Your Feet Cold All The Time?